Wounded Times: DOD report on military family member suicides 4 years late! DOD report on military family member suicides 4 years late! 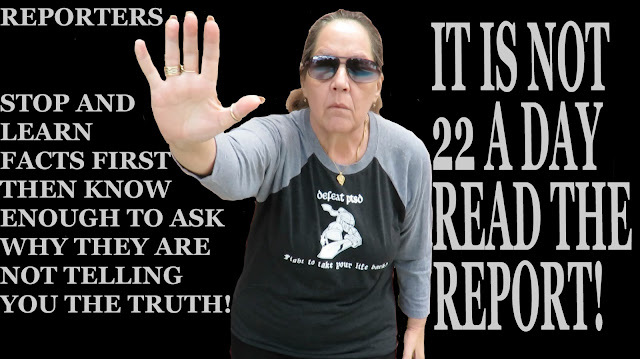 It is not "22 a day" veterans committing suicide. It is not even "20" because too many are not even counted. They do not count when the veteran lives in other countries. They do not count when the veteran has not been given an honorable discharge. They do not count in far too many cases. The truth is, they needed to be able to count on us, but too many are too busy reducing them down to numbers, while families knew their names. We do not even mention the fact that the average suicides within the military are about 500 a year. We sure do not mention the fact that family members commit suicide too. So for all the awareness not being raised, add this to what else you are now aware of! The most important thing veterans and families need to know IS THEY CAN HEAL AND IT CAN GET BETTER!